It's been a little while since I've shown anything TRANSFORMERS-related here, so let's look ahead at some ALL HAIL MEGATRON. To catch up a bit, we've gotten Guido Guidi some help on a few of the issues. And one of the guys helping is Emiliano Santalucia. 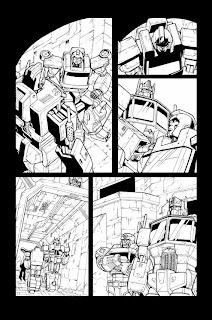 Emil did a SPOTLIGHT issue for us a year or so back, but as you can see by these pages, from issue 10, he's gotten even more comfortable with the characters and is a nice guy to have around. Which is why we're making some plans to keep him around after this. That's great news, I was very impressed with Emiliano's artwork, especially on the Italian DVD boxes for the original cartoon (the character designs were spot on). eptibviHey, this is terrific. Santalucia did a magnificent job on the Blaster issue. Nice tease regarding keeping Emiliano around...could there be an announcment at NYCC about this? 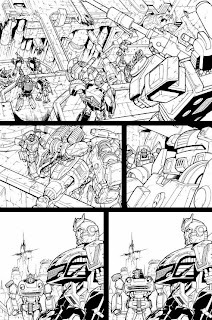 "I think IDW is getting to the point where they have too many great Transformers artists to actually keep busy"
"It does seem that way, Anonymous, but we've actually been looking at just that pleasant problem to have and finding a way to make it work. Which it will, starting in July..."
Zing! Tease #2 Ryall. That's just cruel. Can't wait to see what you guys have cooking. Hans that's a great location for a comic shop! "Honey, I'm just heading out to the red light district to buy comic books. No really, to buy comics, that's it, I swear..."
We just might talk a bit about TF plans at the New York con next weekend, and then likely bigger news by San Diego. I'll be checking the websites for anouncements next weekend! That's hysterical! :) I was in Walden Books once and asked a female employee where they displayed their graphic novels. She gave me the biggest "you're such a pervert" look in the world. After an awkward pause, I said, "you know, comic books." Bit naughty posting this now, but love page 4.